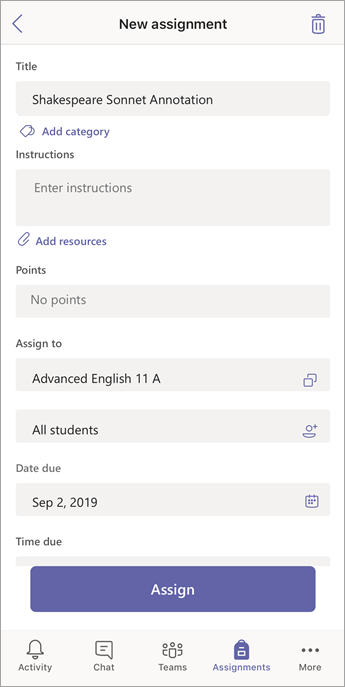 Microsoft Teams for Education allows users to post messages, check notifications, open files, and manage their assignments from their iOS or Android mobile devices. 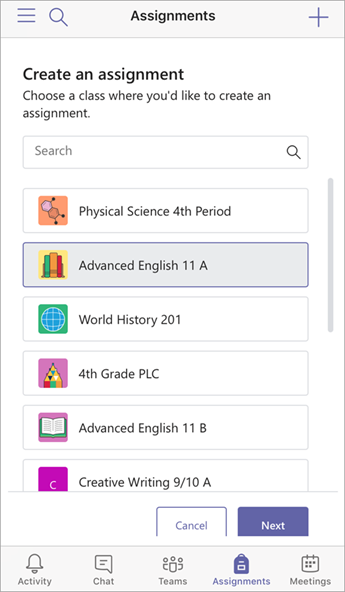 In Assignments mobile, teachers can create and save assignments, while students can attach and turn in their work. Don't have the Microsoft Teams mobile app yet? You can get it here. 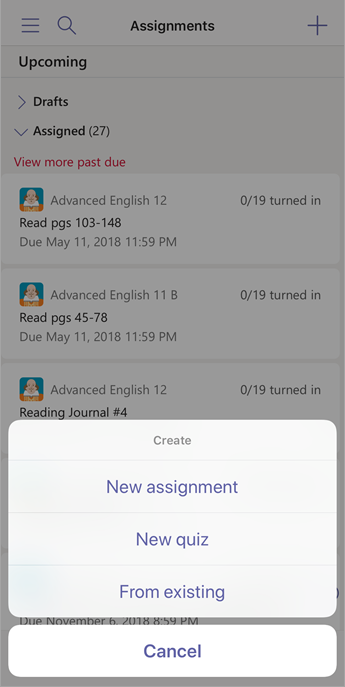 View all your assignments by tapping the Assignments icon at the bottom of your screen. Scroll up or down to view assignments in the past or future. Tip: Use the search icon on your mobile app to search for an assignment by keyword. When a new assignment is created, a post appears in the General channel and students are notified in their Activity section. They can follow these notifications to navigate to the assignment's details. By default, the list of assignments will snap to today's date. Scroll up or down to view assignments in the past or future. On a tablet, toggle between the line and square icons to browse your assignments by list or week view. Tap Go to today to return to today's date. 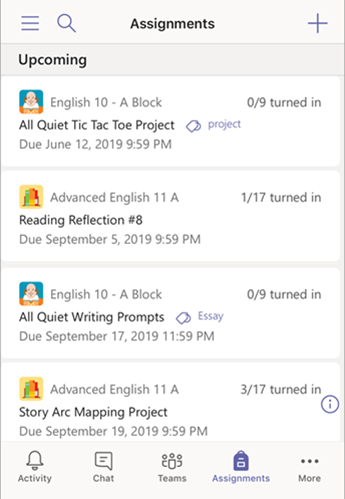 Teachers can create, edit, and delete assignments using their Microsoft Teams mobile app. 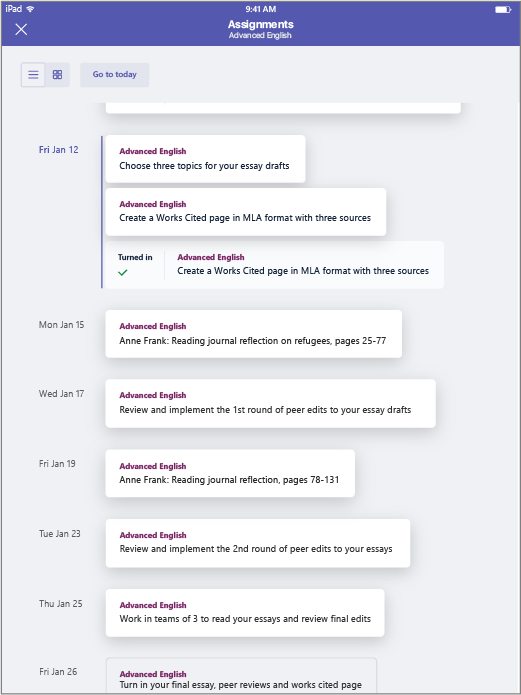 Each assignment card displays how many students have turned in work so far, or if the assignment is in Draft state. Note: At this time, the ability to review assignments is not available on smaller mobile devices but is available on larger devices such as tablets. Support for reviewing assignments in landscape mode for iPad is coming soon. To make changes to an existing assignment, navigate to the assignment card and open it. To edit an assignment, select Edit. Tap Update to save your changes when you're finished. To delete an assignment, select Delete. To create a new assignment, tap the + add icon, then select New assignment. Choose the class you're creating the assignment in, then tap Next. Scroll to enter your assignment's details, such as its title, due date, and points possible. Choose multiple classes or individual students to assign to. Tap + Add resources to attach reference materials or work you want students to turn in. When you're finished, select Assign. This will notify your students that a new assignment has been added. To repost an existing assignment, tap the + add icon, then From existing. Follow the prompts to choose the assignment you'd like to re-use, make any changes, and select Assign. Students can keep track of their assignments and turn them in using the mobile app. Each assignment card appears on its due date. The state at the top of the card indicates if the assignment is Turned in, Returned, Past due, or Not turned in. Tap an assignment card to open it and view assignment details. 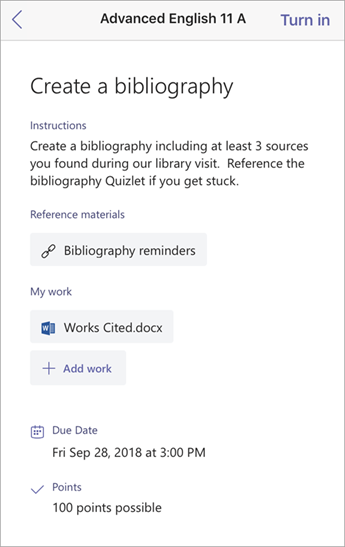 To turn in an assignment, open the assignment and attach any work by tapping the +Add work button and choosing a file from OneDrive or your device. Tap Turn in. Your turn-in will be recorded with a time and date stamp. To add new work to an assignment you've already turned in before the due date, open the assignment and select Undo turn in. To turn an assignment in again after making revisions, select Turn in again.